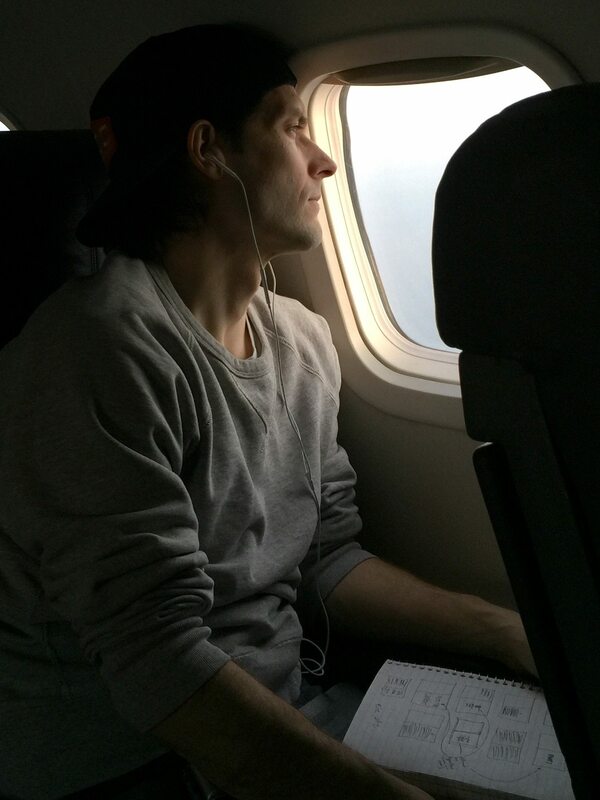 “Flying back from Jakarta to Bangkok … where I was hiding out in an Indonesian hotel room from Interpol. 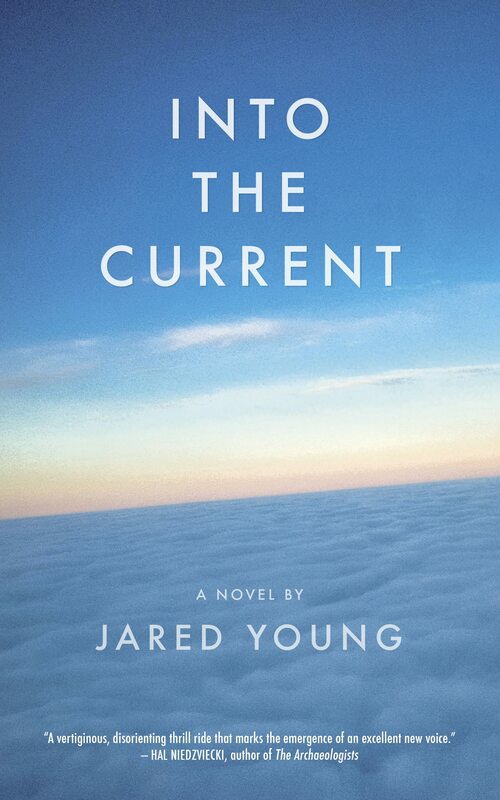 And I was half in a reverie, nostalgic, and fantasizing, and also thinking, ‘What if the plane exploded?’ or ‘What if the plane turned transparent and we all fell through and plummeted to earth?’” Jared Young is recalling the exact moment when he imagined the premise for his debut novel, Into the Current. While I can certainly relate to having a moment on an airliner imagining it spiralling into oblivion, the flight to Jakarta and hiding out from Interpol — that’s all Young. Into The Current is a genre-busting story whose hero finds himself hurtling through the stratosphere after having been ejected from his plane mid-flight and must suddenly confront his past as his life flashes before his eyes in real-time. Young’s cinematic retelling of this pivotal moment is typical of his style — witty, littered with pop culture references, and often slyly profound. We talked about his upbringing in Yellowknife, Ottawa’s unnecessary inferiority complex, and what Margaret Atwood unknowingly has in common with a famous wrestling personality. Though Young’s been published by the likes of the Walrus, Maisonneuve, McSweeney’s, and the Toronto Star, he is refreshingly unaffected. It’s especially admirable considering Publisher’s Weekly recently compared his novel’s protagonist to Billy Pilgrim in Kurt Vonnegut’s Slaughterhouse Five. Perhaps because he’s been living with Into the Current and different iterations of it for about a decade, this early praise is a testament to Young’s determination to nurture the novel through its many awkward phases. Growing up in Yellowknife, Young would read the Syd Field and Robert McKee texts that belonged to his screenwriter father in order to learn about narrative structure. All the short stories he wrote or comics he drew took place in Yellowknife, a place he says he didn’t truly appreciate until he left. But he’s thrilled that the tide is shifting. “There’s this whole new generation of writers like Vivek Shraya, a trans poet and writer, and she’s an expectation-upturning, Can-Lit presence.” He also mentions writers like Mona Awad, and predicts that Zoe Whittall will become one of the pillars of Can-Lit over the next decade. Young admits that as a writer and book lover, he’s always been jealous of people who live inside the literary community, the nucleus of which is in Toronto. But he’s appreciative of the distinction of living outside that sphere. Into the Current is sold out in Yellowknife, and is on back order in many bookstores across Ottawa, a feat Young attributes to the network of people he has up North, and here, in the hometown he adopted 15 years ago. It’s a place where he predicts an exciting future. And yet, when it comes to our idols, we’re all a bit awkward and uncool. Young mentions how he almost talked to Margaret Atwood at the last Ottawa International Writer’s Festival she attended, but he was reticent to stand in line and shake her hand — a regret he compares to an episode of The Simpsons where Homer misses a chance to meet his hero, Mr. T at the Springfield Mall. “Margaret Atwood is my Mr. T,” Young jokes. Maybe he’ll have a chance to rewrite history at this year’s Festival, where he won’t be standing in line. Like Ms. Atwood, he’ll be one of its featured authors. Jared Young will be appearing at the Ottawa International Writer’s Festival on Oct. 25 at the Christ Church Cathedral at 414 Sparks St.